Being a big brother and trying not to yell or coach up your little sibling is probably one of the hardest things to do. Well at least if your Greek and have a brother who is smarter than you when it comes to all science and medicine topics. Let’s be honest here, if it isn’t sports related my little brother probably has me beat. O and he doesn’t have a college degree. Does that matter? OK enough rambling lets get to the point! Where were you on March 27th, 2009? I was having reconstructive elbow surgery and that wasn’t even close to the most important part of that day. My younger brother Steve was having his bone marrow transplant (BMT). Prior to truly understanding how the bone marrow was going to be administered to Steve, I thought it was going to be some intense surgery. I was amazed and shocked that it was being administered as an IV drip. Technology is amazing. That day will always be ingrained in my memory. This past Wednesday, March 27th, 2019. Steve, Phil (older brother) and I found ourselves at our friend’s bar and restaurant called Mars Bar in Lakewood, Ohio celebrating with some family and friends Steve’s 10th anniversary since his BMT. The look on all three of our faces said it all; relaxed and happy. I couldn’t agree more with Steve’s statement to us. We all went on reminiscing about what we all have done in the past three years. I married my wife Camilla and Phil married his wife Alysse. Phil and Alysse have had their first child. We both have moved to different parts of Northeast Ohio after living together in Lakewood, Ohio. All three of us have done a lot of traveling either with family or friends. We sat there throughout the night having our adult beverages, laughing at each other and making fun of each other until it was time for us to head home. I can honestly say it was one of the happier moments I’ve seen Steve in a long time. He just started a new job and seem to be in love with it. On my drive home I began to think, which for those that know me I love to think! I reflected on what Steve has done in the past 10 years. For context sake Steve is now 28 years old and a two-time cancer survivor. In our society I feel as though we sit there and want to judge each other based on our accomplishments with our career choices, our partner choices and whether or not we have kids of our own. And let’s not forget having a college degree. Steve was 18 when he had his bone marrow transplant and he is still trying to finish college, he still trying to get a full time job, he’s not married and he doesn’t have any kids (that we know about). Does that mean that Steve is unaccomplished compared to Phil and I who are both married both with college degrees and Phil has a kid? Absolutely not. What Steve has gone through by staring death in the face (twice) like many other cancer survivors, we forget as a society the emotional toll it does to an individual and we need to remember that what they went through is something that most of us will never go through until the end of our lives when we’re old. Like Steve and many others that are still trying to “find the right career path” we forget that it’s OK just to live life and have fun as normal human being. Those of us that haven’t lived with cancer do not realize what it is like to have to live in a bubble or be poked on an hourly basis for tests. We do not know what it is like to have a scan next week to see if the “C” word is back and restart the cycle of being back in the hospital staring death in the face yet again. 10 years is a long time for anyone. But 10 years for someone that had a bone marrow transplant isn’t just a long time, it’s a second chance at life. To be able to sit there and watch Steve this past Wednesday celebrating with his friends and family where he currently is in life truly was a remarkable scene even though we didn’t make it out to be a huge deal it really was one that I’ll never forget. For those that have gone through what Steve is going through you know exactly what I mean. As a brother of a cancer patient and survivor the emotional toll that it takes on us is not the same as that of the actual patient but it’s still one that people forget about. Phil and I have finally learned to not get angry at Steve when he does things that aren’t of the norm (I still catch myself at times). But again, what the hell is the norm? 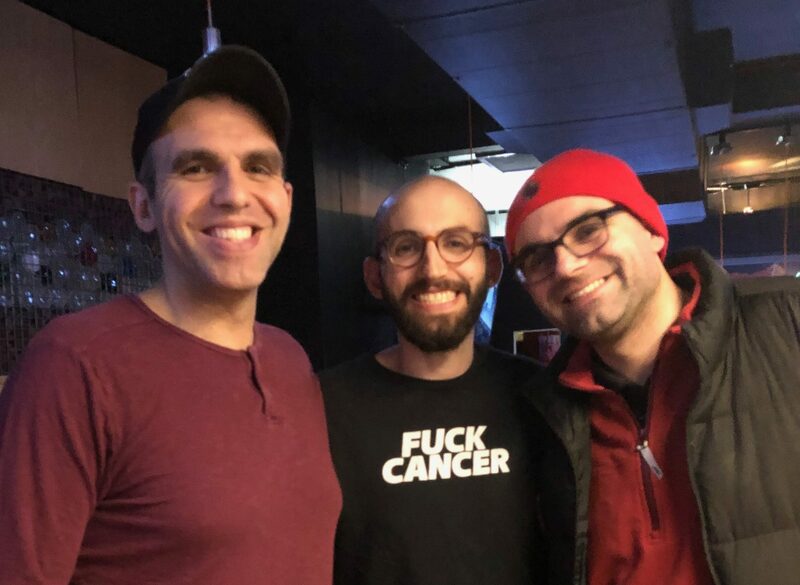 While it was an emotional toll on us as brothers to watch Steve over the past 13 years and his journey with cancer, we still weren’t the ones staring death in the face along the way. We all need to forget what the norm is or what society thinks a 28-year-old should be doing with their life and just be able to accept that there isn’t a norm. The point I’m trying to make here is survivors need to live their lives how they want to live it. As difficult as it is for a brother or any family member watching their loved one go through the challenges of living with cancer, we need to be supportive and not try to tell him or her what to do all the time. Rather than trying to sit there and be angry at someone we need to just be there and sit with them, have a drink with them and sometimes learn how to just shut up and be a supportive brother. I challenge my fellow family members and friends of those fighting cancer to do the same. This has been one of the hardest things to admit and I still find it times correcting Steve on some of his judgments in life or career paths, but it is important to just be supportive rather than trying to coach him up on a daily basis. Long story short – just be there for your loved ones and the rest will take care of itself!